Barn dances are a fun and sociable form of dancing that mostly take place in informal places such as village halls, barns and wedding venues. They are very easy to organise. An average sized village hall is all you need to start with and then invite an audience and book a band and caller. The size of the audience will be dependent on the capacity of the hall that you have booked. Typically barn dances are organised for 60 to 100 dancers. The more dancers you have then the more opportunities there are for dancers to rest whilst other dancers dance. As a member of a barn dance band I have had plenty of experience of barn dance food, and refreshments typically range from hot suppers to cold ploughmans. Jacket potatoes with various fillings, burgers and salad and fish and chips are quite common fare at barn dances followed by homemade desserts. Licensing permitting organisers may choose to sell alcohol or invite dancers to bring their own drinks. The band will always welcome a drink and Hullabaloo barn danceband’s favourite drink at a dance is a good cup of tea! Do we need to know how to dance? The great think about barn dances and ceilidhs is that you can be a complete beginner and still dance every dance. The caller will explain the dance at the beginning whilst the dancers walk through the steps. After a quick recap the music will start and the caller will call the instructions as the dancers whisk through the dance to music. As the dancers become more familiar to the instructions then the dances may be made more complex and sometimes speeded up. The energy is amazing and the dances can become thrilling as you are carried away by the music. Dancers will typically start in sets of four to five couples. These can be long ways sets, square sets or circles. Most people were introduced to barn dancing as children, at school, in the form of country dancing and familiar dances might be the Gay Gordons,Virginia Reel, The Cumberland Square Eight (yes with the basket), Foula Reel and Strip the Willow. Barn dance bands are typically made up of a fiddle, bass and accordion. In recent times guitars, banjos, drums and flutes are all added to the mix. 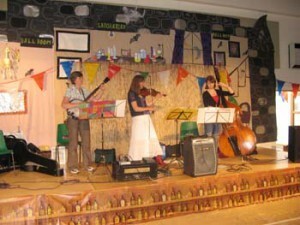 Hullabaloo barn dance and ceilidh band is made up of a fiddle, banjo and bass. The music played is a mixture of Scottish, Irish, English and sometimes American and mainland European tunes. Hullabaloo barn dance band has been playing for over fifteen years in the Reading, Berkshire and Kingston, Surrey area (we also play in Hampshire and Oxfordshire). We play for all types of events ranging from village socials and fetes, school fund-raising, corporate events, milestone birthdays, Scottish dancing groups, St Patrick’s Day and St Andrew’s Day events, anniversaries and weddings. We typically play for up to three hours including breaks and generally from around 8.00pm – 11.00pm. We would welcome the opportunity to play for your next event and look forward to your call. The original meaning of Ceilidhs was a Gaelic social gathering with folk music and dancing and occurred in Scotland and Ireland. They were opportunities for the young people to court and choose future marriage partners and were the main social outlet for rural communities of Ireland and Scotland. They would be held in informal settings such as pubs, village halls and even outdoors. Ceilidh bands can consist of a mixture of instruments and typically are composed of fiddles, accordion, bodhran and tin whistles. More recently drums, electric guitars, banjos and bass may be added or substituted. Dancing at ceilidhs mostly consists of set dancing where couples join a set of may be four or five other couples in a line, square or circle. Dancers may keep the same partner during the dance or it may be progressive where the partners separate during the dance and move to a new dance to form new couples. This can make Ceilidhs very sociable events and good mixers for a group of people who are unfamiliar with each other. Often school children are introduced to ceilidh dancing at school in the form of country dancing where the can learn the basics of promenading, right hand and left hand stars, stripping the willow and sometimes the Gay Gordons. Re-introduced to Ceilidhs as adults they overcome their reticence for dancing and soon remember the fun that can be had by this sociable activity. Ceilidh dances that might be remembered from your youth are The Flying Scotsman, The Virginia Reel, The Gay Gordons, TheDashing White Sergeant, Lucky Seven, The Circassian Circle and the most commonly asked for dance The Cumberland Square Eight (you probably remember that one for ‘the basket’ where the men in a mixed circle spin the ladies round and the ladies feet gradually leave the floor). Dancing is a very enjoyable way of keeping fit and those who go to a Ceilidh will realise how energetic Ceilidh dancing can be. 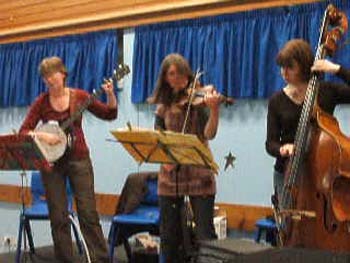 The Ceilidh band are also kept busy with playing three to four tunes per dance set and will set the pace for the dancing. As the dancers become more proficient the band may decide to play at a faster pace adding more energy to the dance and generally setting an exciting atmosphere to the event. So as well as having an outrageously sociable evening you will also add to your fitness in the process. Ceilidh bands may be hired for many types of events such as weddings, milestone birthdays, fund-raising and socials. Hullabaloo is a typical ceilidh band that consists of a fiddle, banjo and bass and has been playing for events in the South East of England, mainly in Berkshire, Surrey and Hampshire. Events range from evening wedding receptions, school fund-raising events, private functions, corporate team-building events and milestone birthdays and anniversaries. Hullabaloo ceilidh band has been playing for over fifteen years and is well known in the Reading and Kingston area. The Ceilidh band’s testimonials reflect its popularity with a variety of audiences ranging from young to old. Hullabaloo would welcome any enquiries to play at your next event and are available for bookings throughout the year.